SYLVAN LAKE, AB – The first of two breweries set to open soon in Sylvan Lake, a small community west of Red Deer in Central Alberta, has announced that it will be debuting its core beers at a pair of tap takeover events later this week. 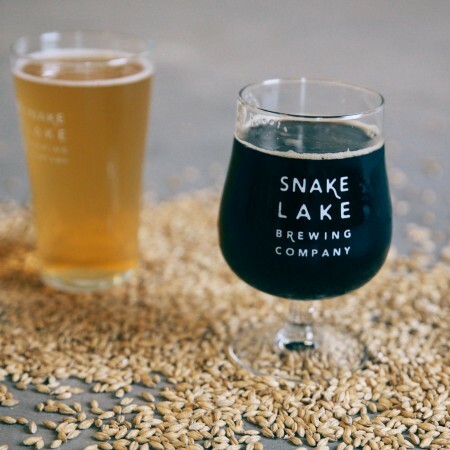 Snake Lake Brewing – named after original name of the town and the lake it sits on – has been founded by Adam Nachbaur and brothers Bill and Dean Beekman. The brewery will be launching with four brands that have names and labels inspired by local lore and landmarks, including Kinabik Pilsner (5% abv, 25 IBU), Varsity Hall Red Ale (5.5% abv, 35 IBU), Sidewinder IPA (6.5% abv, 45 IBU), and Commodore Stout (6% abv, 40 IBU). More details about the beers and their back stories are available on the Snake Lake website. The public launch of Snake Lake’s beers will take place at Cilantro and Chive in Lacombe on Thursday February 8th, and at Old Smokey’s BBQ Shack in Rocky Mountain House on Friday February 9th. 355 ml cans will be available soon at liquor stores throughout Alberta, and the Snake Lake taproom is planned to open later this month at 26 Industrial Drive in Sylvan Lake. For more details, see the Snake Lake Brewing Facebook page and website.